If chest day is the only time when you load the Olympic bar with some heavy weight, you might want to reconsider your training program. Having great pecks for the price of keeping your back weak and under-stimulated won’t bring you any closer to your ultimate ideal of a strong, muscular physique. So unless your primary reason for lifting is building a more impressive beach-ready front side, use the following advanced back routine to sculpt a huge and powerful back! One of the saddest truths in the weight room is that most guys seem addicted to pressing movements without any awareness of the much required balance between presses and pulls. In other words, to build a balanced, healthy and optimally strong body, especially if you struggle with back development, you need an equal amount of pressing and pulling. And for every heavy bench press you do, you should be ready to perform an adequately heavy pulling exercise. This is kind of the most obvious yet hard to follow rule for bodybuilding progress, and it’s time to put it into practice. Not to mention that including more pulling movements in your routine on a regular basis will allow your bi’s to realize their growth potential. 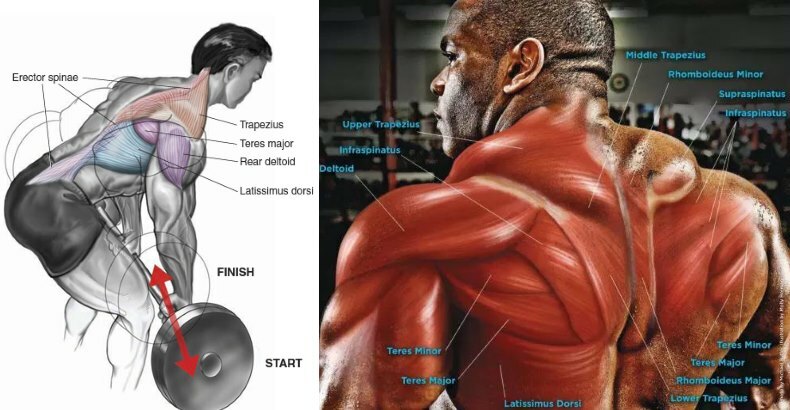 Your back needs to be trained both hard and effectively, which is why this workout is based on the most efficient moves for building epic width and thickness in the back – the wide-grip pull-up and bent-over rows – while the supporting moves include cable rows, lat pull-downs and lower back extensions. When it comes to bodyweight exercises, the wide-grip pull-up is their crowned king. Besides giving your entire body a challenging workout, pull-ups with a wide grip will train your lats more intensely and thoroughly than any other pull-up or chin-up variation, and will push your core muscles to grow substantially denser and stronger. Due to the increased difficulty, your core musculature will have to work harder to maintain stability and balance, and the effects will be felt in every aspect of your performance. The bent-over row is one of the greatest old-school compound movements that powerfully hits the lats, rhombs, read delts, traps and even biceps, and using it properly will ensure you are getting optimal benefits out of your back training. And if you’re an avid bench presser, know that the bench press and bent-over row go together like peanut butter and jelly – by counterbalancing what the bench press does for your pecs, the row will help you build a strong and stable upper back and protect your torso from muscle imbalances and posture issues. To reap these gains, keep your form as perfect as possible and if wear a weightlifting belt if necessary. You will start with a five-minute warm up on a Concept2 rowing machine, if you have one of those available at your gym. Continue warming up with a light set of lat pull-downs and one set of pull-ups. For the working sets, limit your rest periods to 60-90 seconds between all sets, and reduce them even further between supersets. Include rest-pauses on the last two sets of pull-ups to maximally fatigue the muscles. On bent-over rows, you will start with a lighter weight and then pyramid up; on cable rows you’ll do the reverse. Finish the workout with lat pull-down/back extension supersets to exhaust all posterior muscles in the upper body and get a monster pump. Make sure to focus on the back muscles on every rep, and limit arm involvement as much as possible. Whether you like it or not, your back defines your physique, and if you don’t work on it you will miss on the opportunity to build a powerful, balanced and healthy body. One of the most prominent characteristics of a well-developed, athletic physique is undoubtedly the three-dimensional V-taper that makes a lifter look huge and impressive, so it’s no wonder that this is also one of the hardest area to fully develop. Sometimes the reason for this is that people tend to avoid training what they can’t see, sometimes its sheer laziness or worse, an unhealthy infatuation with the chest and biceps. Don’t be one of those guys who do only the exercises they enjoy and then wonder why they don’t get respect in the gym. It’s time to think big and train for greatness!